Successful Seminars: Converting in the "Red Zone"
The most successful NFL quarterbacks in the history of the game are the ones that consistently convert red zone opportunities into points.The same is true for financial advisors who do seminar selling. 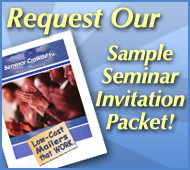 Seminars are a great source of new clients – but only if you can convert attendees to appointments. 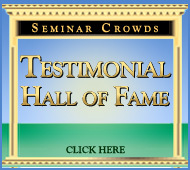 Converting the seminar attendee to an appointment in a critical step in any seminar system, and if done successfully can deliver unprecedented growth in your financial practice, and help you achieve Johnny Unitas status among your peers. When utilizing seminars to build a business there are several critical elements that must be mastered to achieve outstanding results. The most basic, but also one of the most challenging, is getting the attendees to ask for an appointment. Here’s a suggestion for the best way to approach this sensitive issue without being overtly aggressive, which can be a major turn-off for attendees. Four key steps to a successful seminar presentation. Before the seminar begins, each attendee should receive a worksheet.The worksheet must have three sections.The top section should be an area to write their name address and phone number. The middle section should be a list of items that may be important to them. For example, funding their children’s education, or retiring comfortably in Florida, may be items that you would include on your list. Make sure the list is diverse and comprehensive, and leave a blank spot for them to include something that you may not have thought of. You should instruct the attendees to check off any topic that is important to them. The third and final section should be an area for them to select a time and day for their appointment. This worksheet is going to be an important tool in setting appointments, as you will soon see. The second key to a successful seminar presentation is to have an entertaining and captivating PowerPoint presentation. Too many advisors are using technical and detailed presentations that simply aren’t effective.A well designed seminar will have three main sections. The first section must establish your credibility. This is accomplished by having a qualified assistant (by qualified, I mean someone who is comfortable speaking in front of people) do the first few slides, and introduce the main speaker by telling the group about the speaker’s background and credentials. It’s very important that when the assistant has completed the introduction and the speaker is making their way to the front of the room that the assistant start the applause. When you walk into the room full of potential clients and they are all applauding two things are happening.First, the applause will motivate you to put on a good show, and more importantly the group has accepted you and is excited about listening to what you have to say. The third section of the seminar is referred to as the shot-gun section.The purpose here is to cover as many different topics as briefly as possible, as quickly and briefly as possible.A good shot-gun section could include topics such as: annuities, mutual funds, asset allocation, IRA’s, estate planning, life insurance and long term health care. At this point in your presentation the objective must be to press as many buttons as you can.The attendees all have different interest and needs.When you hit a topic that’s important to them the odds of setting an appointment increases dramatically.Your primary objective is to cover as much ground as possible in order to gain relevance with your attendees. The fourth and final section is to grab their attention and focus on the benefits of doing business with you and motivating them to set an appointment.The benefits could be that you will review their accounts every six months, or you do everything one on one with them, and that everything is individualized for your clients.Once you get through this section you are ready to close the entire group, all at the same time. There are several ways to set appointments with seminar attendees.The most effective is to close right now while they are still in the warm and fuzzy zone. At this point in the seminar process there should be several closing slides.When completing the closing section it’s advisable to give them an offer that they can’t refuse.A very effective offer is a 1 hour free consultation.The most effective way to accomplish this is to describe the appointment process, and to emphasize that in the first appointment there will be no specific recommendations made and to leave there check book at home. At this point you simply tell them what to do and the first thing you tell them is when you are willing to see them. A simple way to do this is to tell them you have cleared your schedule for the next 2 weeks and that you generally see your first appointment at 9:00 AM and your last at 4:00 PM.The next step is to tell them to complete the bottom portion of the worksheet and indicate which day and time would be convenient for them to come in for their free consultation. It is also advisable to tell them that your assistant will pick up all the worksheets at this point and when they are all collected dinner will be served.This should give the attendees the impression that the worksheet is their dinner ticket and they have to turn it in. After the assistant collects all the worksheets they can be organized and specific dates and times for their free consultation can be established. Of course, not all attendees will complete this section, but with a little closing skill the assistant can assign them a date and time. When all the worksheets have been collected and organized the speaker can determine which people did not indicate a time and date for an appointment. At this point it is a good idea for the assistant to set appointments with the attendees that indicated a time and date on the worksheet and the speaker can talk with the attendees that did not indicate a time. The speaker should be looking for areas that might be of interest to the attendees making it easier for the assistant to set an appointment with them. 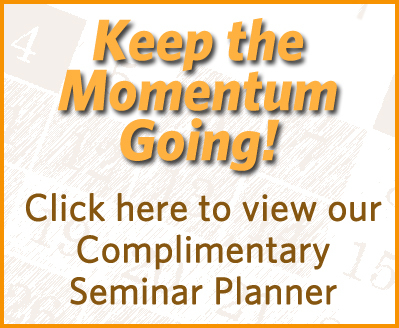 The national average for setting appointments with seminar attendees is around 40% of the buying units. With a little effort and a Johnny Unitas attitude you can achieve closing rates of around 75% to 80%, twice the national average. Done properly, seminars can set you apart from the pack and produce results you have only dreamed about. When you master the four keys to having seminar attendees ask you for an appointment, new prospects will be falling over each other to meet with you.